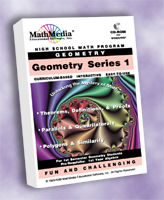 This set contains the first three programs of the series: "Theorems & Definitions with Proofs", "Parallels and Quadrilaterals", and "Polygons and Similarity" each providing in-depth instruction from which students can self-teach, practice with lots of understandable help, do better in their classroom, and prepare for the SAT/ACT by working from a menu of clickable topics, introductions, examples, questions and step-by-step help. Each stand-alone program contains a 30-question test printable with or without solutions. Patience for the perplexed and fast as the brightest -- it's up to the student. Extensive VOCABULARY sections and review of pre-requisites included. Print FLASHCARDS of theorems and definitions. Includes Programs 1, 2, and 3.